who have worked hard both with us and for us. The plaques which honor the recipients hang in the Executive Board Room at Federated Headquarters where they can be seen by all who visit the Federated offices. 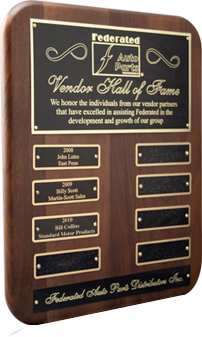 The Vendor Hall of Fame does not recognize companies but rather individuals that have helped make a difference for Federated and our members. It is a great recognition for the individuals who have truly been dedicated to creating excellence together through the years. 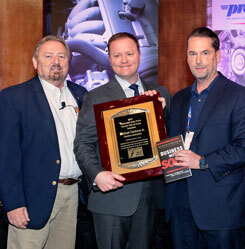 East Penn Manufacturing Co., Inc.
Michael Cardone, Jr., Bo Fisher.